This smoked collard greens recipe is perfect not just for a low carb diet but for keto diet too! With 9g of fat and 1g of carbs, you can enjoy this delicious side dish guilt-free. Heat olive oil in a large pot over medium heat. Add garlic, and gently sauté until light brown. Pour in the chicken stock, and add the turkey leg. Cover the pot, and simmer for 30 minutes. 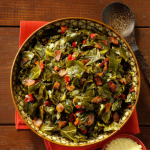 Add the collard greens and bacon to the cooking pot, and turn the heat up to medium-high. Let the greens cook down for about 45 minutes, stirring occasionally. Reduce heat to medium, and season with salt and pepper to taste. Continue to cook until the greens are tender and dark green, 45 to 60 minutes. Drain greens, reserving liquid. Mix in red pepper flakes if desired. Use liquid to reheat leftovers.